Theses are clips from our student shows. Cara plays and sings "Brighter Than The Sun", Rachel jamming on jazz, Eleanor plays and sings "A Team" and "The Only Exception:"
Each course includes 8 weekly 1-hour sessions with up to 6 students. Class meets once a week for 1-hour at the same day and time. The price is $275. To register for a course please use links below, call 646-703-0007 or email NYGuitarAcademy@gmail.com. ​You do not have to travel with a guitar as we have guitars available for you to use in class free of charge. You will need to have a guitar at home to practice with. We sell beginner to advanced guitars and accessories. 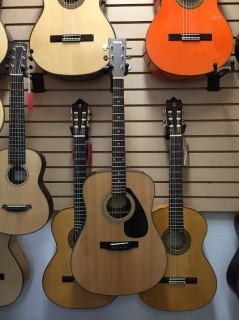 Please visit our guitar parlor to view our selection. You can also rent a guitar for $30/month for you take home. We have 2 different types of beginner courses, a Basics Guitar course and a Classical Guitar/Flamenco Guitar course. Below you will find description for the General Guitar course. If you are interested in the Classical Guitar/Flamenco Guitar course please click here. There is no prerequisite for the classes below. These classes are for students picking up the guitar for the first time. We also offer level 2, 3 and 4 classes for students who want continue or join up already knowing the basics. ​Need a guitar? Purchase a beginner guitar pack below. It has everything you need to succeed. We will have it ready and tuned up for your 1st class! Yamaha F325D Acoustic Steel String Guitar along with a padded gig bag and a clip-on snark tuner and picks. You can purchase it here at $209. It comes with everything you need. This is a great guitar to start with and makes it easy for beginners to succeed in their new journey of guitar.